On Tuesday, April 16, Tech defeated the Savannah State Tigers in a blowout, 14-1. Tech used the long ball, hitting five home runs, to take an early lead and the Jackets never looked back. Tech is now 27-10 on the season while the Tigers fell to 21-16. Freshman pitcher Jonathan King made his fourth start of the season and with it picked up his third victory to improve his record to 3-2. King allowed no earned runs while striking out four batters and pitching only two innings. 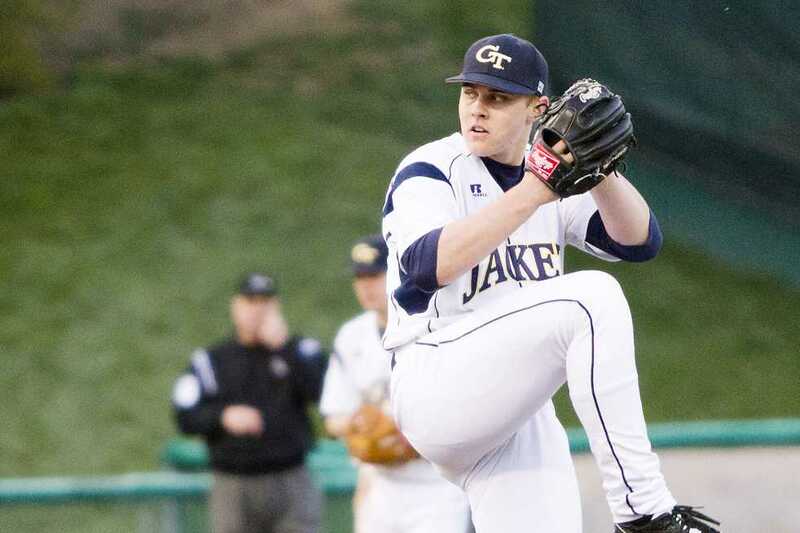 Six different relievers would combine for seven innings of shutout ball for the Jackets. Josh Heddinger threw two innings, giving up three hits, but always found a way to escape trouble. Junior Alex Cruz pitched the ninth and struck out two batters. “We were hoping to get to use a lot of guys. We had already planned to pitch a bunch of guys. It was nice to get a lot of runs early and then we got everybody in that we wanted to get in. It was a good night,” said head coach Danny Hall. Daniel Palka went 3-4 on the night with four RBIs and two home runs, his tenth and eleventh of the season. Catcher Mitch Earnest made the most of only is seventh start of the season, going 3-4 with four RBIs and a grand slam. Earnest also scored two runs himself. Designated hitter Zane Evans also had a solid night going 1-3 with two RBIs and two walks while also scoring two runs. For Savannah State, third baseman Joseph McCrary was very productive. He had three hits in four at bats and also scored the Tigers’ lone run of the game. Designated hitter David Richards went 2-3 and also had the Tigers’ only RBI. It did not take long for Tech to get the bats going. In the bottom of the first, after senior third baseman Sam Dove reached base on a fielder’s choice, junior designated hitter Zane Evans blasted his eleventh home run of the season over the left field fence to put the Jackets up 2-0. Next up was junior outfielder Palka, who hit a solo homer to deep center field to extend the Jackets’ lead to 3-0 Tech would add four more to the lead after a grand slam by junior catcher Mitch Earnest. After Tech brought twelve batters to the plate, Savannah State would finally get out of the inning when Brandon Thomas flied out to shallow left field. Savannah State would score one in the top of the second to make the score 7-1, but the Jackets would respond quickly. Evans walked to leadoff the bottom of the second, followed by another Palka home run to put the Jackets up by eight. Both teams would go scoreless in the third and fourth innings, but Tech would continue to add to their lead in the fifth. Dove led the inning off with a double to left field and would eventually score n a single by Palka to increase the lead to nine and put the Jackets up 10-1. In the bottom of the sixth, senior Mott Hyde would blast Tech’s fifth home run of the night and his first of the season. Earnest would later score on a sacrifice fly by Brandon Thomas to put Tech up 13-1. Tech would add one more in the bottom of the eighth on an RBI single by Michael Hodorowski to make the score 14-1. Cruz would then come in to pitch and threw a scoreless ninth inning to finish off the Tigers. “I thought we swung the bats really well and that we were really selective with the pitches we hit,” Hall said. Tech will get back to ACC play this weekend when they host a three game series against North Carolina State. Due to the spring football game being at 7:30 p.m., first pitch on Friday between the Jackets and the Wolfpack will be at 3 p.m.
Next Tuesday, Tech will be headed down the road to Turner Field to take on the Georgia Bulldogs in the second of a three games between the rivals this season. Tech won the first matchup between the two earlier this season in Athens.